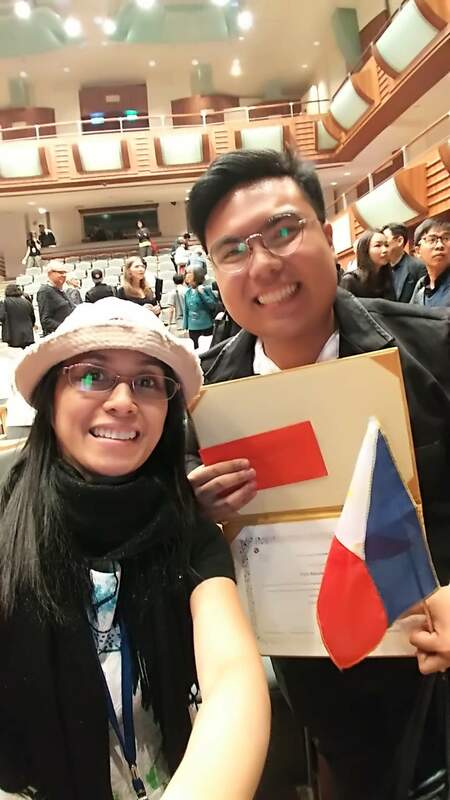 On October 23, 2018, Ryle Nicole Q. Custodio, a composition student from the UP College of Music, became the first Filipino young composer to have won first place during the 35th Asian Composers League (ACL) Young Composers Competition held in Taipei, Taiwan. His winning piece, Ngunit Lumaban Siya Sapagkat Tapos Na ang Panlilinlang sa Kanya (But She Fought Back Because She Cannot be Fooled Again), for Flute and Viola was one of the two pieces which garnered the highest points among nine other pieces from different countries. The other winning piece is like speaking into each other's mouths for Clarinet in Bb and Cello by Marcus Jackson from New Zealand. Ryle's piece tries to evoke the feeling of unravelling a person's capacity to think for himself after the long due freedom from being blinded and fooled by the governing body. "I couldn't believe my ears when the host called my name as one of the equal first place winners. It felt very overwhelming to know that even though I was probably the youngest among my fellow competitors, I managed to win the award," Ryle said. "While I was going up to the stage to receive my award, I already knew the right thing to do – proudly wave the Philippine flag," he added. Ryle, as this year's first place winner, will be automatically commissioned to write a piece to be performed in the next ACL event in 2020 which will be held in Christchurch, New Zealand. Prior to this stint, Ryle has also recently showcased his compositions in the Philippines, Thailand, Ukraine and Japan; and has received lessons from internationally acclaimed composers such as Chinary Ung (USA/Cambodia), Toshio Hosokawa (Japan), Koji Nakano (Japan), Stefan Prins (Belgium), Jaime Reis (Portugal), Bettina Skrypczak (Switzerland), and Diana Rotaru (Romania). Ryle is currently on his 4th year and is studying composition under the tutelage of Dr. Marie Jocelyn Marfil.